"Happy Days are here again with the premiere of a brand new UK tour based on the hit TV series, featuring the unforgettable 'King of Cool' Arthur 'The Fonz' Fonzarelli. Join your favourite '50s family, the Cunninghams and the rest of the gang - Potsie, Ralph Malph, Joanie and Chachi as they battle to save their beloved diner Arnold's from demolition. In a race against time, can everyone's favourite hero 'The Fonz' save the day? Happy Days: A New Musical is written by Garry Marshall, the legendary creator of the television series. Garry is also the director of many world-wide smash-hit films including Pretty Woman, Beaches and The Princess Diaries 1&2. It includes 21 original songs by Oscar, Grammy and Golden Globe award-winning Hall of Fame Songwriter, Paul Williams (Bugsy Malone, Evergreen, Rainy Days and Mondays). The show also contains the much-loved Happy Days theme song from the TV show. Henry Winkler, the original Fonz from the television series will serve as Creative Consultant, working alongside the director in creating the Happy Days world of 1959 America and guiding the cast in creating their ever so familiar characters, especially that of The Fonz. Starring Heidi Range as Pinky Tuscadero, Ben Freeman as The Fonz and Cheryl Baker as Mrs Cunningham. 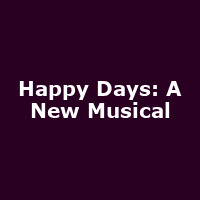 Happy Days: A New Musical is a hilarious feel-good musical that is guaranteed to have you rocking' and rollin' all week long!"